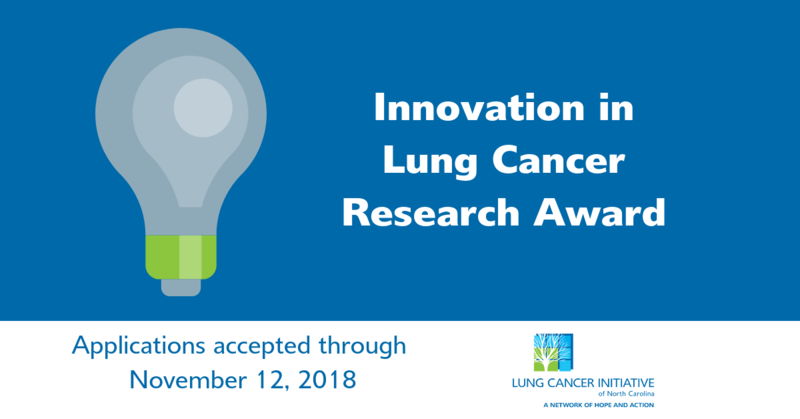 The Innovation in Lung Cancer Award recognizes and supports researchers and collaborations aimed toward developing innovative lung cancer projects that will improve the lives of those at risk of or with lung cancer in North Carolina. The award is granted for one year. The stipend is $25,000. Any questions regarding the submission process should be emailed to Jenni Danai, LCI Director of Programs. Please complete the attached application and send to Jenni Danai. All applications should include a current CV along with a letter of support from a program department director or supervisor. The Innovation in Lung Cancer Research Award is open to researchers of all levels and at all institutions and companies across the state of North Carolina. Researchers who have received funding from the Lung Cancer Initiative in the past are not eligible to apply. The project must be focused on one of the following in lung cancer: prevention, diagnosis, treatment or survivorship. Projects that are collaborative are strongly encouraged.